It took seven hours of hearings in New York City, but NHL commissioner Gary Bettman has rendered his verdict on the Dennis Wideman suspension: it stays. The 20-game suspension was originally administered by NHL director of hockey operations Colin Campbell, but Wideman appealed. He’s already served seven games of the suspension and has cleared concussion protocol with the league, which addressed the NHLPA’s contention that he was under the effects of a concussion at the time of the incident. The players’ union will now appeal Bettman’s upholding of the suspension. They’ll go the route of independent arbitration, with Georgetown University law professor James Oldham tapped as the guy to hear the case. If Oldham upholds the league’s suspension, that’s the end of the line for Wideman and the NHLPA and they’ll have to live with the ban. It should be noted that this is the first time the NHLPA has taken things this far. Flames president of hockey operations Brian Burke said his organization was “astonished” by the suspension. “We disagree vehemently with the decision that was reached here,” he said on Wednesday. The predominant issue for Burke and the Flames now appears to be the length of time the entire process is taking, as it eats into their ability to seek out a third party to appeal the suspension. Given that all Bettman did was “rubber-stamp” the initial ban, Burke says that things should’ve been moved along at a quicker rate. But Bettman, in a 22-page dissertation released Wednesday, points to multiple factors in upholding the suspension. Wideman’s general attitude, for instance, is a factor. 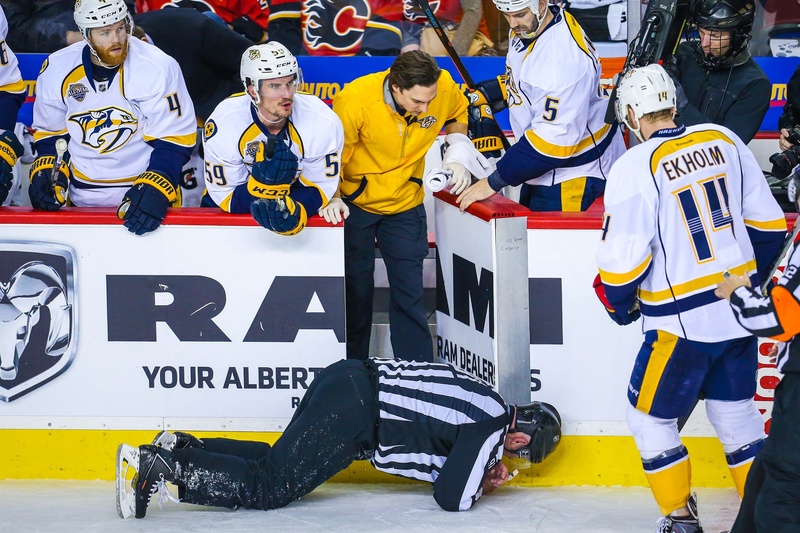 The incident took place in the second period of the January 27 game between the Flames and Nashville Predators. Wideman “converged” with linesman Don Henderson, who was skating backwards, and raised his stick to deliver a “forceful blow” to the upper back of the official. Both Henderson and Wideman was subsequently diagnosed with concussions, but neither left the game. Henderson has been out since the incident, however, and there is no timetable for his return.